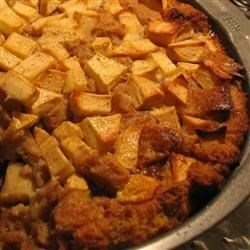 "Awesome bread pudding with fresh apples and cream! Best served hot with ice cream." Preheat oven to 350 degrees F (175 degrees C). Peel, core and cube the apples. Lightly grease a 13x9 inch baking pan. Cover the bottom with half of the bread cubes and then sprinkle on half of the apples. Repeat with the remaining bread and apples. In a large mixing bowl combine the eggs, cream, sugar, milk and cinnamon; beat well. Pour this mixture evenly over the bread cubes and apples. Bake at 350 degrees for 35 minutes. Serve hot. Very easy and yummy recipe. The apples are an added touch. I recommend this to anyone who's in a hurry and wants a great desert. First try at bread pudding. Excellent recipe. I added a whiskey sauce for the topping.